In today’s modern world, our smartphones hold almost all our important data, memories, contacts, events and almost everything. But why we have everything in one small device? Simple, it’s convenient and easy to share. With Smartphone manufacturers providing more and more Internal storage, we tend to put more of our important data in our phones. But in an unfortunate event where you end up deleting your data by mistakely or your Phone gets stolen, how do you recovery that data? 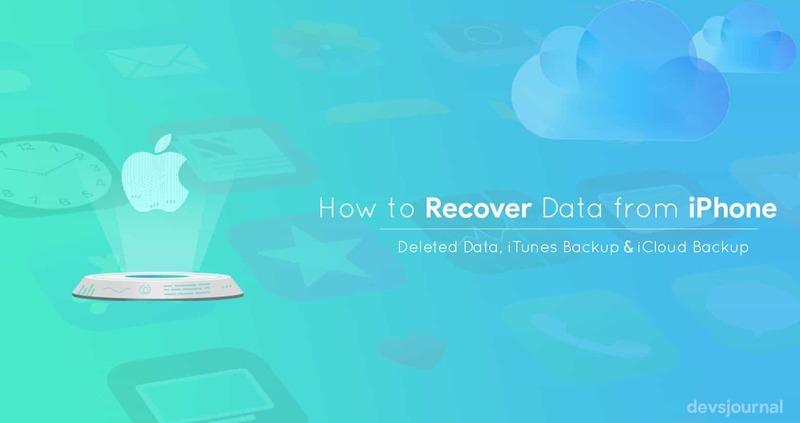 In this guide, we’re going to guide you how to recovery data from iPhone, iCloud Backup or iTunes backup in single click. Recently I lost my iPhone X 256GB which had over 15GB of very important data and I completely lost hope of recovering it from anywhere as my iCloud didn’t have much photos backup on cloud servers. I tried different paid and free tools for recovering from data from my iTunes backup but some worked to provide me partial data while some didn’t work saying couldn’t find any backup. Recently, I found PhoneRescue which an iPhone as well as an Android data recovery software. 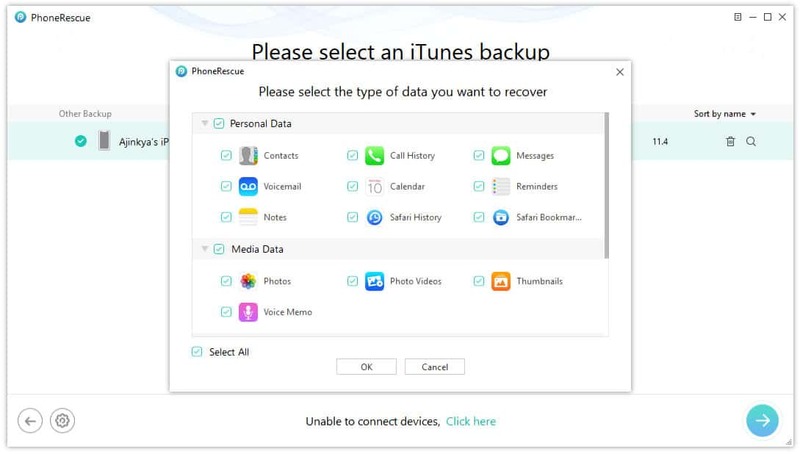 PhoneRescue seemed to be a better option because of its claims of providing all your data from any backup of your iPhone or any deleted data from your iPhone’s storage (unless it’s overwritten). iOS platform is much more memory efficient compared to Android or any other Smartphone OS. In order to save space, Apple has introduced many new file formats which are available for iOS only and can save lot of data in a small memory. But when it comes to recovering this data, Apple doesn’t provide any support and you’re all by yourself. Recovering those file formats aren’t easy and you would require a proper data recovery tool. Unlike Android, Apple stores backup via iTunes and iCloud which are inaccessible directly. But iMobie has created an iPhone data recovery tool which has almost 100% success rate with a very simple process. 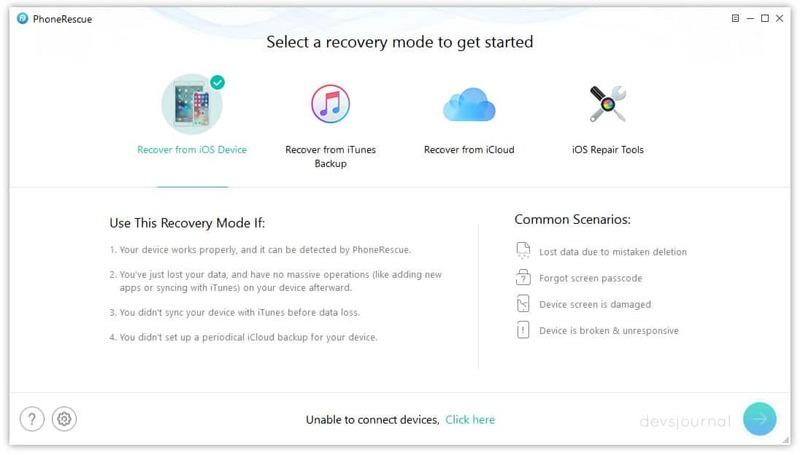 PhoneRescue is data recovery software for iPhone from iMobie which supports all iOS devices and can be used on Windows as well as Mac systems. PhoneRescue not only recovers the data but also provides a real time view of individual files and allows you to select the files you want to recover thereby saving time and memory space. Very straightforward and easy to use Interface. Allows data recovery from iPhone storage. 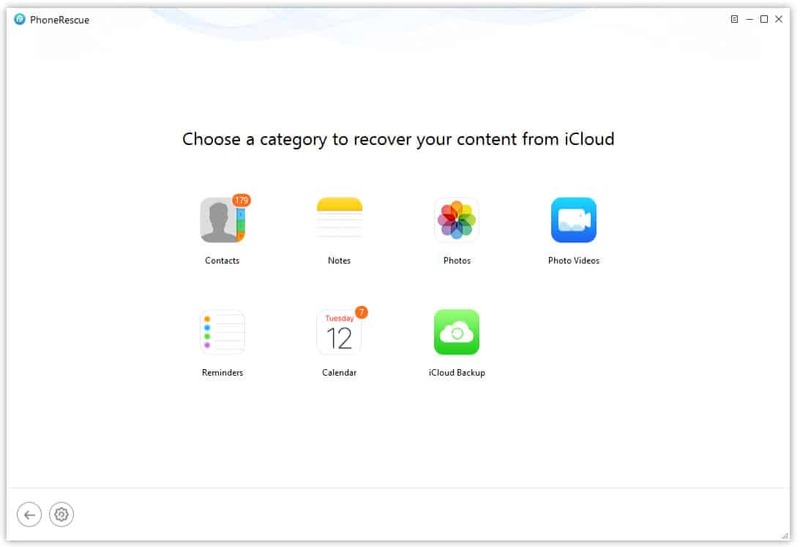 Allows data recovery from iCloud backup. Allows data recovery from iTunes backup. Allows iPhone software repair in case of device not booting up or black screen. Transfer recovered data directly into new iPhone or Computer. Can restore data from iPhone, iCloud and iTunes. Also comes with iOS device repair to fix software issues. Allows to recover data from encrypted iPhone backups. iCloud backup doesn’t work if you have Two-factor Authentication enabled on your account. Step 1. Download iMobie PhoneRescue software and install in on your system. You need to buy PhoneRescue License to recover all the data completely. Step 2. Start PhoneRescue software and connect your iOS device to your Computer using the original Apple Lightning cable. Step 3. Once your device gets connected, you’ll see your device’s name at the bottom of the window. Click on the arrow button to see what data you want to recover. Step 4. 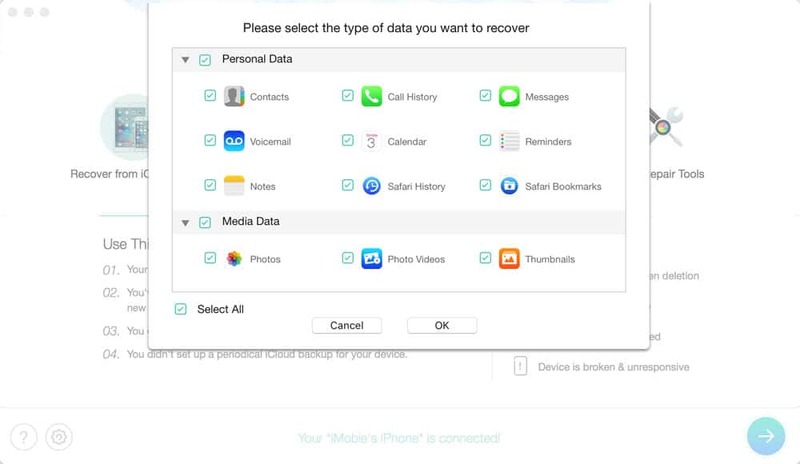 PhoneRescue will scan your device’s Internal storage and analyse if there’s any deleted entry of the data type (Contacts, Photos, call history or other) you selected. Step 5. Once the scanning process completes, you can view the scanning result in PhoneRescue. Both lost and existing data on your device are displayed in categories. To filter out the existed data on your iOS device, you can choose the option “Only list deleted” instead of “List all items”. Step 6. You can select the data you want to restore and click on the Arrow to start the restoration process. Step 1. Install PhoneRescue software and purchase a license to get all the recovered data as the free versions only allows some data recovery. Step 2. 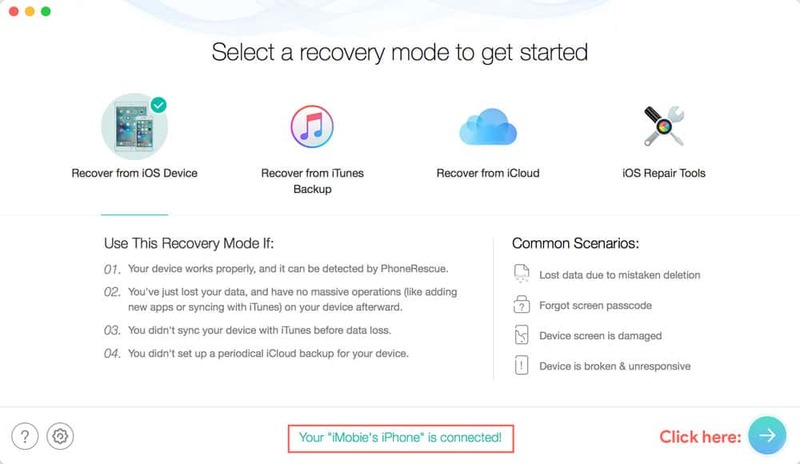 On PhoneRescue window, click on “Recovery from iTunes Backup” and click on the arrow icon at the bottom right corner. Step 3. 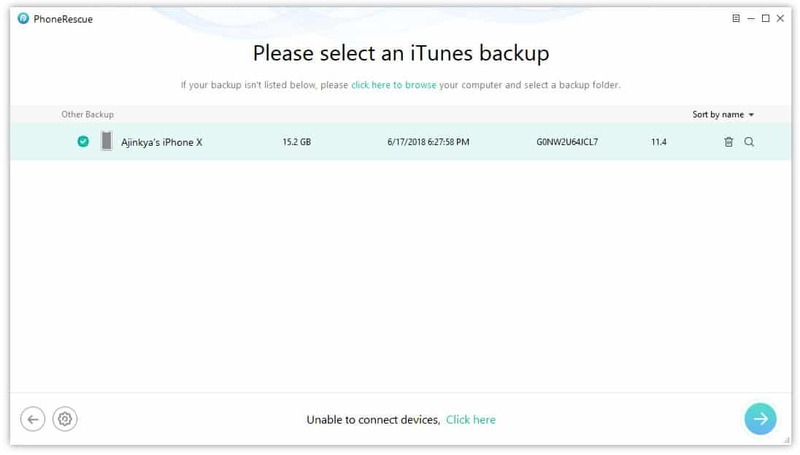 Immediately, PhoneRescue detects the iTunes backup on your System and shows the backup size, backup device name, date of backup and Software version of the device when the backup was taken. Step 4. Select the backup you want to restore, in my case I only had one backup. Click on the Arrow icon to select the data you want to recovery. Step 5. 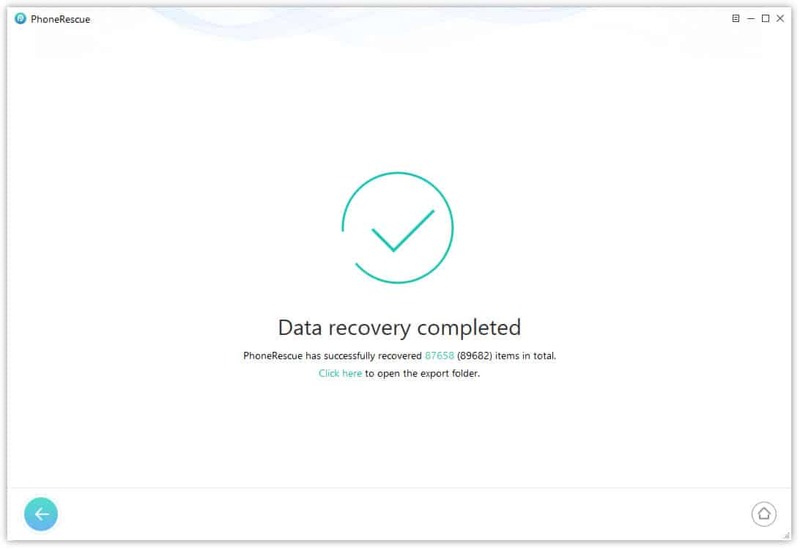 Select the data (You can select all the data as PhoneRescue doesn’t has any data limit) and click on the Arrow icon to begin the recovery process and check all the individual files. Step 6. 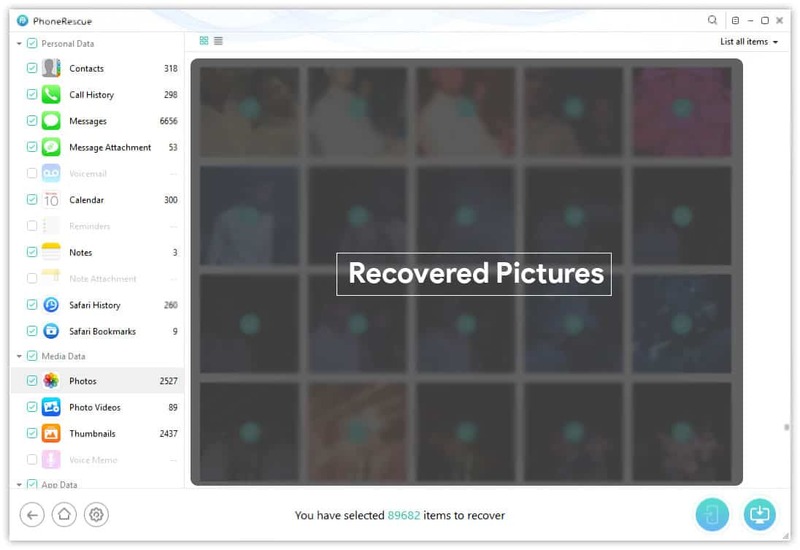 Once the recovery process is completed, PhoneRescue would show all the individual files from each category. You can select the categories and even individual files to restore to your iPhone or PC directly. Step 7. Restore the data to your iPhone or PC by clicking on the icons at the bottom right. Click on it to begin the restoration process. Step 2. Open PhoneRescue window, click on Recover from iCloud and click on the bottom right corner arrow icon. Step 3. PhoneRescue would ask your iCloud ID and password (PhoneRescue doesn’t collect your credentials). Enter the ID password of iCloud account from which you want to get the data. Step 4. 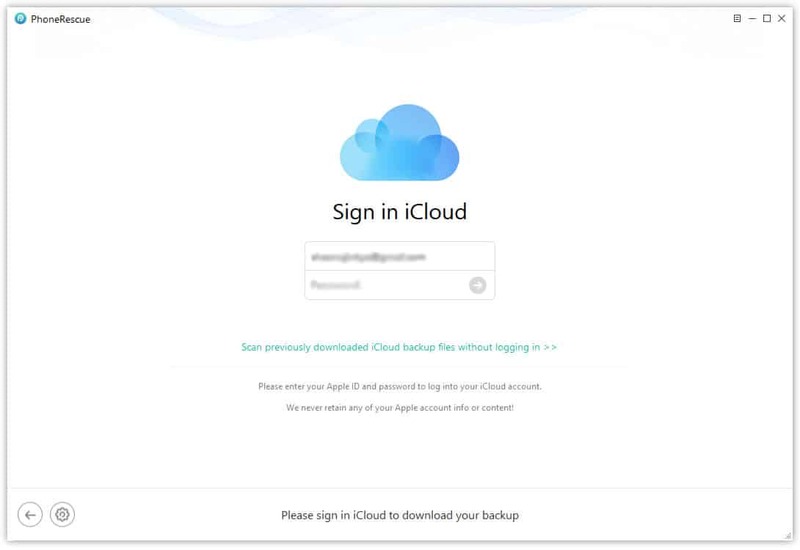 After successful sign in, you’ll see the data available in each category on iCloud servers. Step 5. Select the category (Contacts, Photos, Calendar or others) and you’ll see a restore option to download the data on iPhone or PC. You can restore this recovered data to your Android device, PC or another iPhone device directly. PhoneRescue is not only an iPhone data recovery software but also provides options to fix your iPhone’s broken software by performing a fresh software installation from Apple servers without voiding your warranty or erasing any data. Step 1. Connect your iPhone device which has any software issues like Black screen, device stuck on Apple logo or restarting loop. Step 3. 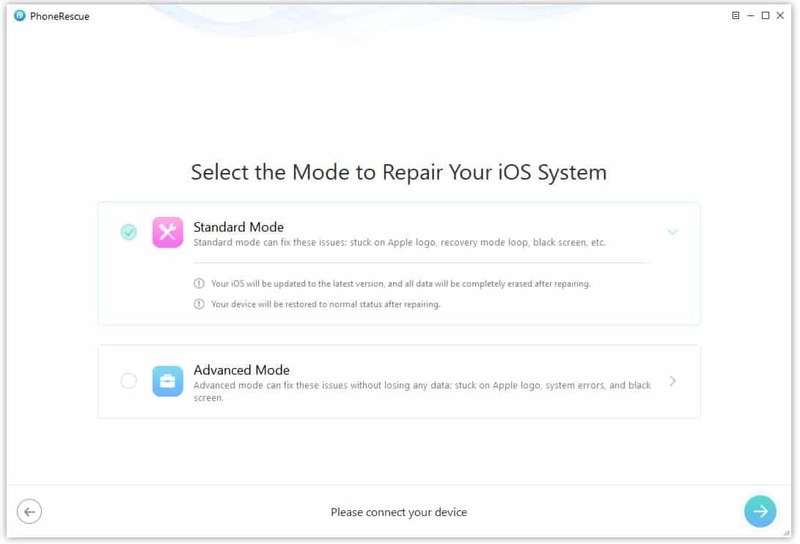 Select the preferred mode (Advanced recommended) and click on the arrow button to begin the repair process. 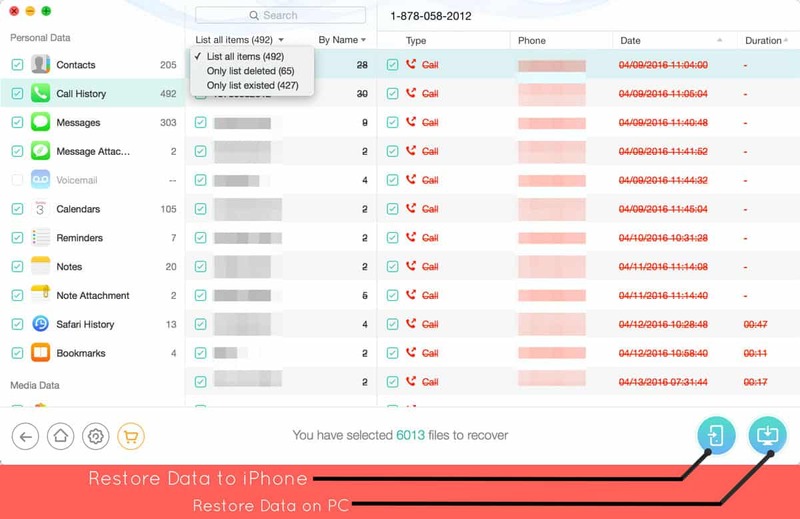 PhoneRescue allows to restore iOS data very easily but it comes at a price of $49.99 for a single license. But I believe my data is lot more valuable than $50 for this product. Also, PhoneRescue also provides a 60 days Money back guarantee if you’re not satisfied with their product. While there are many products which claims to recover your lost data, I found PhoneRescue to be the most efficient and easy to use. Do let us know what you think about this process? Do you know any alternate method which is less expensive and as efficient as this one?